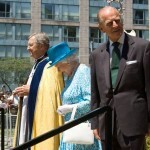 On July 4, American Independence Day, the Queen of Canada, as Prime Minister Stephen Harper called her throughout her recent visit, attended a Sunday morning service at St. James Cathedral in downtown Toronto. 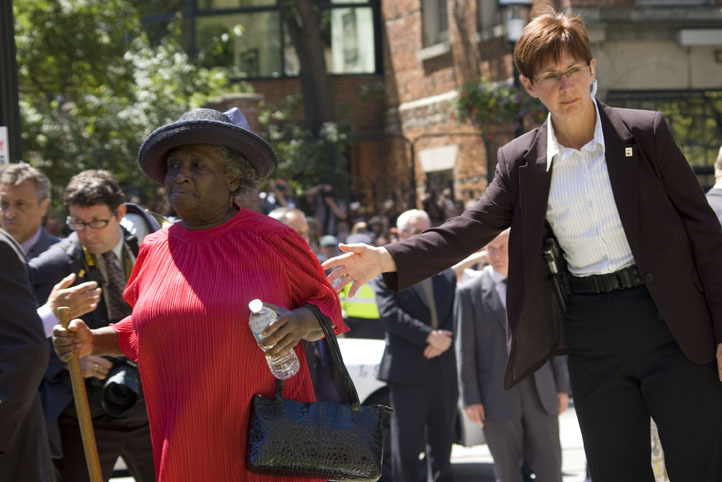 Four days after Canada Day, the choice of a service at St. James, one of the most visible manifestations of Toronto’s increasingly atavistic ‘English connection’, was a reminder of the living presence of history. 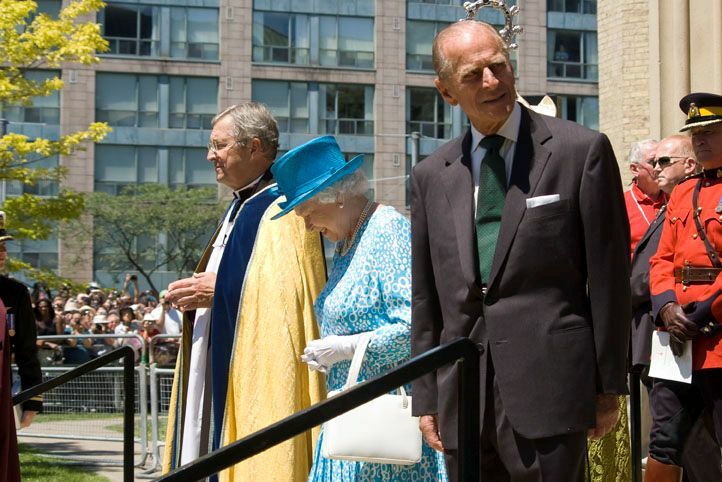 This was poignantly apparent in Queen Elizabeth’s personal decision (according to Kevin S. MacLeod, Canadian Secretary to the Queen) to present two peals of hand bells to the Chapels Royal of the Mohawks. 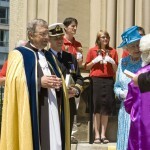 In so doing, as the Archbishop of Toronto Colin Johnson and the day’s homilist Cathedral Rector Douglas Stoute reminded the 700 sweltering bodies inside the Cathedral and the thousands lining King and Church Streets outdoors, the Queen honoured a relationship that pre-dates the existence of Canada by more than 150 years. 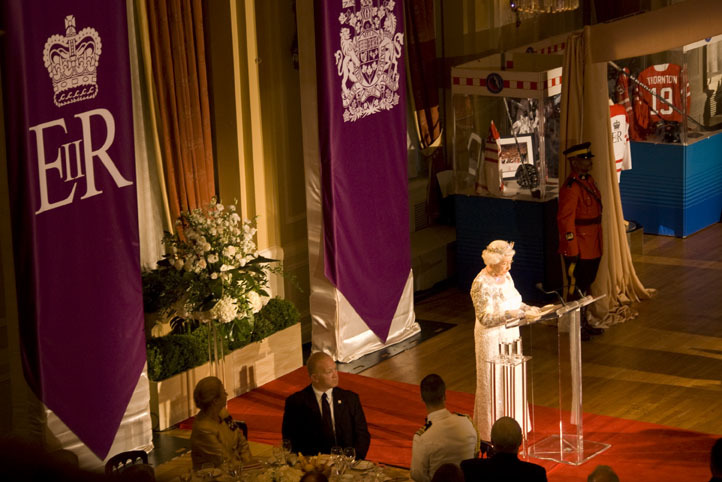 In 1710, a Six Nations delegation visited the court of Queen Anne asking for her support. 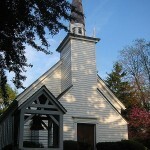 The first Mohawk Chapel was built in 1712 in the Mohawk Valley. Following the American Revolution and the defeat of British forces, loyalist Six Nations people were awarded a sizeable land grant in the Haldimand Treaty of 1784; and the first ‘Mohawk Chapel” was erected by the Crown in 1785. The relationship between Crown and some Iroquois was enhanced by the continued loyalty of Grand River people during The War of 1812. The present day Mohawk Chapel, renovated in 1983 in Six Nations territory on the Grand River, is the only Royal Chapel in North America. It was so designated in 1904 by Edward VII. 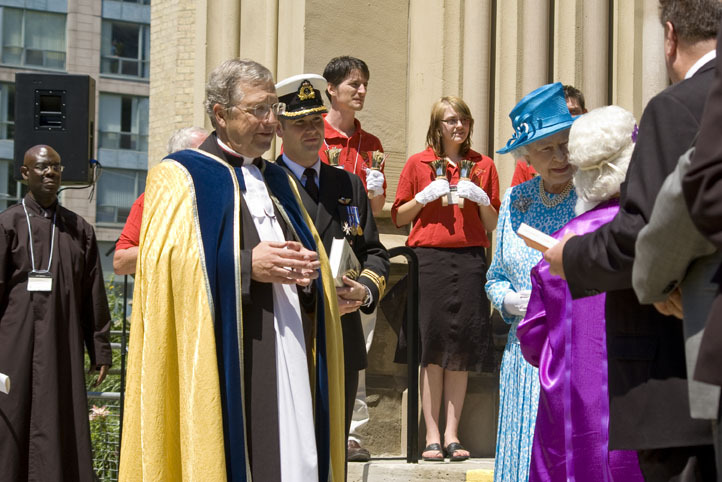 In his well delivered, but somewhat charmless, platitudinous remarks, which included boilerplate references to family, hockey and a kids’ charity run by a donut company, Stephen Harper paid no heed to the kind of history the Queen had underscored powerfully just the previous day. Oren R. Lyons is a traditional Faithkeeper of the Turtle Clan who was raised in the ancient culture and practices of the Iroquois on the Seneca and Onondaga reservations in northern New York State. An accomplished Native American leader, writer, educator, historian, activist, speaker, and organizer, Lyons has spent the much of his life working on issues concerning native indigenous peoples in North America and around the world. He has represented native peoples in many forums, including several at the UN focusing on the rights and status of indigenous peoples, the environment and sustainable development. Lyons is a member of the Seneca Nation and of the Six Nations of the Iroquois Confederacy in New York state. David Kupfer: You’ve said that our present problem is our notion of what progress is in society. What do you think progress as if survival mattered would look like? OL:Well, a solution would be a collective approach. We’re trying to do that, we have to do that at all levels. But in this system of commerce, it’s a hard road to get the right synergy between people, nations and banks to work together. If you’re not inclusive in solving any problem, it is not going to work. Inclusivity is exactly what is needed. All these birds are flying near everything you can see, they all have to be part of it. If they’re not part of the solution, it’s not going to work. I don’t think the human beings would last beyond the trees because it keeps them civilized, it keeps them in check. if it’s just about the human beings, it would just be just one big fight, no morality. You need nature to keep the people calmed down. We need the sun. That’s our oldest brother. If you’re not inclusive, it’s not going to work. And that’s a serious problem with capitalism. Capitalism is private property. They have been trying to organized Indians to be private property owners forever. We still refuse. DK: What does it mean to be a Faithkeeper of the Turtle Clan among the Onondaga people? OL: A Faithkeeper is a sub chief. You have the titleholder and his partner is a sub chief. The Onondaga people are the only Indians to have sub chiefs called faith keepers. The principle chief that I’m sitting with now is my youngest brother, and he’s doing very well, running ceremonies. I remember when the clan mother asked me to take this position in 1965, I said I just don’t have what it takes to do that. She said just try, we need you. I said I don’t speak the language that well, and I don’t have the credentials. She said I wouldn’t ask you if I didn’t think you could do it. That clan mother saw. I was just a young man at that time. I wind up here 44 years later an elder, I have more respect for her as I get older even though she is long gone now. DK:How important are your nation’s ceremony’s to maintaining your culture? OL:The reason why we have ceremonies is to teach our people respect; that’s why we have ceremonies, to keep our respect going. Six days of Thanksgiving. Six days it takes to run a ceremony. 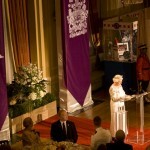 Every day different food, different speeches, different dances, different entities. Thanksgiving Thanksgiving Thanksgiving. Prayer, hours of it, songs, dances, hard work, you get tired, but its collective, you don’t think about yourself, you think about everything, that’s the attitude that people have to have. The New Age people, they want to come spend time with the Indians and have ceremony and then they go back and they say, I had a wonderful experience. Give me a break, if you think it is about having an experience, you are nowhere. But they don’t know and they are trying, I see people really reaching for the spiritual thing but it’s not transferable. It’s a tough one. The people have surprised me, how bad they can be, how good they can be, myself included, I won’t exclude myself on that. I’m not a spiritual leader. I am a runner, I do the best I can. A lot of times it’s not adequate. I’m an elder just by elimination. DK:What is the tree of peace and its significance in your nation’s history? OL:The tree of peace comes from the beginning of our Confederation. Peacemaker came, and he brought peace to the five nations. Some people say it took him 100 years to bring them altogether. Finally on the shores of Onondaga Lake, he gathered all the leaders and laid out the whole process about how people will be involved with governments and structure and rules, raising leaders and how clan mothers will be in charge of of the titles. And the 50 original men were chosen from the five nations were instructed. Each one of those men became an office when they died, so Tayoquai is a thousand year-old title. Those 50 original men were instructed, and after he laid out the whole process governance, instruction, responsibility, he said, now I going to plant this great tree of peace, as a symbol of Ahoudianshone, the six nation confederacy, this great tree of peace will reach to the sky, he said, provide shelter and have four white roots that go into the four directions of the earth, and those people will know the place to go to follow the root back to the source, will come under the protection of the great law of peace. And he said this is a spiritual representation of the universal law. And he instructed leaders never to challenge those laws. He said, you cannot prevail, do not challenge those laws. Because you will not prevail. So now here we are. A woman asked him after you’ve done all this, how long is it going to last? And he said, that’s up to you. So it’s up to us, it’s up to you and me. You can’t blame anybody for what’s happening, it’s in our hands. The last responsibility goes to the chiefs. When we have a condolence and we raise a new leader, the instruction comes to obey all laws, responsibilities to the Clan Mothers responsibilities to the faith keepers, responsibility to the Chiefs, and finally he talks to the people, and they have the most responsibility the people do. Not the leaders, the people. That is what he says, you are the backbone of the nation. You are the ones that do the work. You are the ones that build the fires. You are the ones that gather. Not the leaders, the leaders help guide you. Now that goes for everybody. You turn around to America today and everyone’s looking to Washington, asking, what are we going to do? Well that’s stupid, Washington? Give me a break. That’s the source of a problem. So it’s going to be up to the people. You are going to have to build your communities and they are going to have to be self-sustaining, get to the high ground and get water, that’s my instruction to you, high ground and water, don’t be on the low ground. DK:The United States founders got so many ideas about democratic political systems from Native American, but what is in practice now is more in word than in deed, so what went wrong? OL:It started to go wrong right off the bat. In 1744 there was a meeting in Lancaster Pennsylvania. And the governors of New York, Pennsylvania, Delaware, and Virginia were there. They were arguing over land and the Six Nations were presiding at this meeting. Finally, it got around to one of the Onondaga Chiefs, and he said, you guys are never going to amount to anything if you keep arguing amongst each other. He said, why don’t you make a union like ours. Look how old we are. Look how respected we are. Look how strong we are. Work together, make a union like ours. The guy who was taking notes was Walter Golden, he was a speaker and note taker and historian. He was taking all those notes and they went down to Philadelphia to be put in a book, and guess who was the printer? Ben Franklin. Franklin read that and said that’s a good idea. Ten years later he called it the Albany Plan of Union. Twelve of the thirteen colonies, let’s bring them all together and work together. And he asked the six nations to preside and a great leader called Hendrick Mohawk presided, to talk about democracy and governance. Very practical, very real. They wouldn’t accept it. There was a spy for the King of England at the meeting, and he sent a letter to the King of England saying King you better beware, they’re having a meeting here about government by people, in 1754. You don’t know your own history. This is all referenced in John Mohawk’s book, Basic Call to Consciousness. So out of this came the Continental Congress. The Continental Congress called themselves the 13 fires and they called their assembly the grand council, and the first flag they made had a pine tree on it. These are all our symbols. Up to 1775, they met with us at upstate New York, a place called German Flats, and they wanted us to join in their union in their fight with their father and our Chief said at that time, well it is a fight between father and son. We don’t think it’s a good idea to be involved. And they said good that was our second request, if you’re not going to fight with us, don’t fight against us. And the chief said well whoever is going to win, it will still be our problem, because they are going to want our land. So they made a treaty. So they went back in the Continental Congress, made a wampum belt with this agreement. In 1776 they had a meeting on Fort Pit, that is now Pittsburgh, they presented this relationship and they said we like this so much, we will carry this through the Great Lakes, stay neutral, stay out of it. And they said to us then, you’ll never have to fight we will fight for you; you won’t have to raise your arms again. So that was the first treaty with the new United States with the Six Nations. When George Washington saw that, he went ballistic. We need the Six Nations he said, they have got to fight with us or we’re going to lose. So he dismantled that without telling us. We did not know that. They expunged all that from the history. They took it all out and you don’t hear or read about it. A guy by the name of Morgan was doing the mediation, and his papers were discovered in a woman’s house here in California, in Santa Barbara. So Dennis Banks gets a look at these papers, calls me and says, hey, you better come look at this, it looks real to me! And the pages of his field manual, which are in the University of Pennsylvania museum, the pages from 1775-1783 are torn out, those pages were in there. So did we have something to do with the development of this nation? I would say yes. We were there, even after the revolution. If you go out to the headquarters of the Continental Congress in Philadelphia, Independence Hall, that green that is out in front belongs to Six Nations. Our camp was right there. DK: The Iroquois nation seemed to have had a spiritual center and moral authority. That doesn’t seem to be the case in terms of what was created for this nation. OL:No, that’s what we told them, you guys are starting out wrong, they said well, we have too many religions, we can’t find one. Where are your women? No women involved here? Once they won that first fight, they reverted back to some European thinking. DK:What is the Great Law? OL:The Great Law of peace was the foundation that the peacemaker laid down when we gathered all the people there. That was our structure, that is what we abide by today, that is our governing structure. DK:What relevance do you think it has today with the U.S. government? OL:It’s the democratic foundation of this country, but it is quite complex, it’s a moral law as well. It’s pervasive, it’s in everything. It’s our spiritual law, when we have our ceremonies, parts of this law will come up during the ceremony. It’s ingrained in our way of life. It is a foundation of the Confederacy, it’s a broad concept, it includes so many different things, it is our Constitution. It is a moral law, as well as instruction. We know it when we raise a leader and we go through that whole process, people are reminded all the way down to the last detail, it’s a very long day. We have a wampum strings, we have a are a lot of ways to keep our process. We use them all when we raise a leader. Our leaders are raised for a lifetime. When somebody dies or gets sick enough, then they are replaced, and that process is used again. So it’s a continuing process, it doesn’t have an election, how we select leaders, it the rules of our government, it is all in the great law, it’s very complex, very profound. Also we have some help, we have the wampum belts, the rules are in there. Our condolence cane has the rules in there, they are very specific. We have ways it to keep track of it, when the planting season starts, then we rarely call a grand council, it’s either before or after. During the growing season, the plant season, it is kind of a sacred time. We pay attention to that. The process is still there, it still completes how we raise our leaders. DK: Is agriculture still a major focus of your community? OL: Yes, corns, beans, and squash, the three sisters and the other leaders in the planting season. We have ceremonies around the lunar year, the first ceremony of the new year is maple and that starts when the sap runs and lasts until it stops. The next ceremony is for the planting, the next is strawberry, the next one is the bean, the next one is a corn, and the next one is the harvest. And then than midwinter, for 21 days, we say we wrap the year in a bundle. 21 days of ceremony. All Thanksgiving, all songs, all dances. You are really tired by the end of that time, everyone is tired but that’s what we do. DK: Are there many other ways you pass on your culture? OL:That’s the only way we pass it on. Its active, that is how we operate today. So Chief has a lot of work to do, no compensation, we don’t get paid. We are still operating as we did 1,000 years ago, there was no getting paid idea back then. Cheap labor. DK: And being sovereign, how are your nation’s relations with the US government? OL:We fight them tooth and nail all the time. They know who we are. We are the last traditional government in North America. Probably, maybe in the world. Maybe if you go way into the middle of the Amazon where the natives haven’t met anyone yet, you’ll find somebody there who runs themselves. As far as we know, we are the last of the last Chiefs. All the other Indian nations in the country are elected by the Bureau of Indian Affairs. We don’t have any BIA on our nation, we don’t allow the BIA on our land, and we don’t take federal money. We are still who we are. They know us, they know us very well. The federal government knows us. I get followed from time to time, I see them, but they are in disarray. The BIA is even out on the Navajo and Hopi land, they still have their tribal elders… But they’re not in charge, we are in charge. DK:Have you been successful at keeping your young people on the land? OL:We don’t have enough houses now. Everybody’s piling back. You guys are in a bad position here, you are in big trouble. No taxes back home. You’re on the land. We haven’t got enough room. Half our people live off the nation. They’re all trying to get back on now, because things are collapsing. DK:How big is the nation? OL:We don’t count numbers. That’s the first thing they want to know, how many men do have. We have enough. DK: You were involved in the Global Forum on Spiritual Parliamentarian Leaders, what sort of the output did that group had? OL:They came to a final conclusion. It came down to four words: Value change for survival. If you don’t change your values, you are not going to survive. Simple as that, and that’s what came out of that. Values for survival. What values are you going to move to? Come to our values? Long-range. Seven generations. Behave yourself, get into the cycle of nature. DK:Any other thoughts how to transfer the reverence for life and nature that your people have, transferring that to other peoples? OL:The first thing would be just leave us alone. The only people you can really ask that would probably be the people of Six Nations now. Because everyone else has been taken over. If you asked that question to anyone else it would be, what are your values as a Presbyterian? What are your values as a Catholic? They are the ones that took over, the ones that took the language away, Christianized everyone, took our land besides. So you ask how many people have those values? Probably of the Six Nations just the Onondaga, the Oneida, and the Tuscarawas. The Mohawks have an elected system and a chief system, and the Senecas as well. 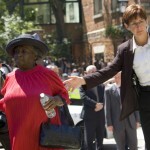 The Cayuga’s are wavering now, they want a casino. So just three nations left in the world. Tuscaroras are mostly Christian, but they adhere to all of our laws. The Chiefs are still there, they are very good fighters too. DK: Sometimes it seems our tenure here on earth is very much in question, how hopeful are you? OL:One of things we are instructed as leaders when we first take on this responsibility is not to take away hope from the people. As a leader, do not take away hope from the people. If you’re going to bring hard news, you better bring something else with it. The news that we have today is pretty dire, I was telling you about Banyandieo, when he heard all this and showed him four days and showed him what’s coming. After seeing all that he asked is this going to happen? And they said, yes it will and they said and he said if that’s the case then what’s the use? In 1799. And they said, you tell your people that the generation that allows this to happen is going to suffer beyond all comprehension. You don’t let it be your generation. That’s your instruction to the people. So in other words, it’s going to happen, but it can be held off as long as the people want to work for it. It’s up to the people, it’s in the hands of the people. It is up to us right now. It is this meeting here at Bioneers, this meeting of the good minds, people here are trying. Indians can’t do much, there is just a handful of us. We do have some ideas and we do have some instruction. We still know how to pray, we still know how to keep those ceremonies. We were told as long as we keep the ceremonies and carry them out, we are going to hold on. What was it that they tried to kill first thing when they got here? They took all of our paraphernalia, put it in a pile, and burned it, because we all had to be Christian. They were not able to do that. We are still here, I am not a Christian. We are holding the line, so every time we have our ceremony, it is on your behalf. People say, we want to come to your ceremony. We tried that one time, and it didn’t work, but don’t worry, what we are doing is on your behalf. The idea is that it gets done. The idea is that those thanksgiving, those ceremonies get finished and that’s what we do. We do it on behalf of the whole earth, we do it on behalf of generations coming. We don’t differentiate between black children or white children, its just children they are all the same. So we got a do it, that’s what we do. It is quite formidable, we might be small but we are still here.